The winners were presented to the Curwood Festival board at their monthly meeting in April. Stories were to be written in the style of noted local author James Oliver Curwood who wrote action/adventure stories and was open to all public, parochial, and home schooled students in grades 4th through 12th in Shiawassee County. The writing contest is to promote an interest in school age children in writing and to help keep the memory of James Oliver Curwood alive. The Curwood Saga Contest Chairperson Denice Grace would like to thank her sponsors: Coldwell Banker agent Chuck Stoner, Cordier Excavating, City Councilman Burton Fox, Senator Rick Jones, Jumbo’s Burger Bar, and Gilbert’s Hardware and Appliance for their support to our event. 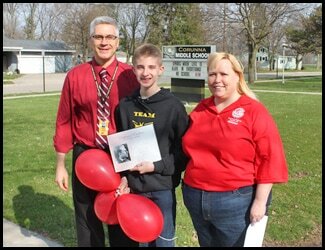 She would also like to thank Owosso Middle School teacher Greg Hall for encouraging his classes to participate. The contest is open to public and private schools in addition to several home schools in Shiawassee County and the Ovid-Elsie and Chesaning areas.